Strain typing of pathogens: what is E. coli? Editor's note: This is part 2 of a 3-part series written for Gobbles, the official publication of the Minnesota Turkey Growers Association. E. coli-associated diseases are perhaps the most recognized, yet least understood of all the bacterial diseases of turkeys. The disease is collectively referred to as colibacillosis, but includes many syndromes ranging from skin infections through systemic disease involving bloodstream infection. Most producers are very good at identifying birds impacted by E. coli. However, the underlying issues regarding how and why disease occurred are complex. It is true that the majority of birds impacted by E. coli disease are the result of some other primary insult (i.e., a viral pathogen, air quality issues, or other stress issues). However, not all E. coli are created equal. Most E. coli from turkeys are “commensal,” meaning they are not able to cause disease on their own. Some E. coli have extra genes that make it much easier for them to cause disease – these are referred to as avian pathogenic E. coli, or APEC. 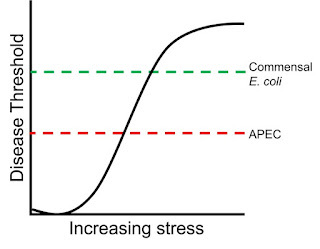 Both commensal E. coli and APEC are always present in a barn. However, APEC lower the threshold for clinical signs of disease to occur. 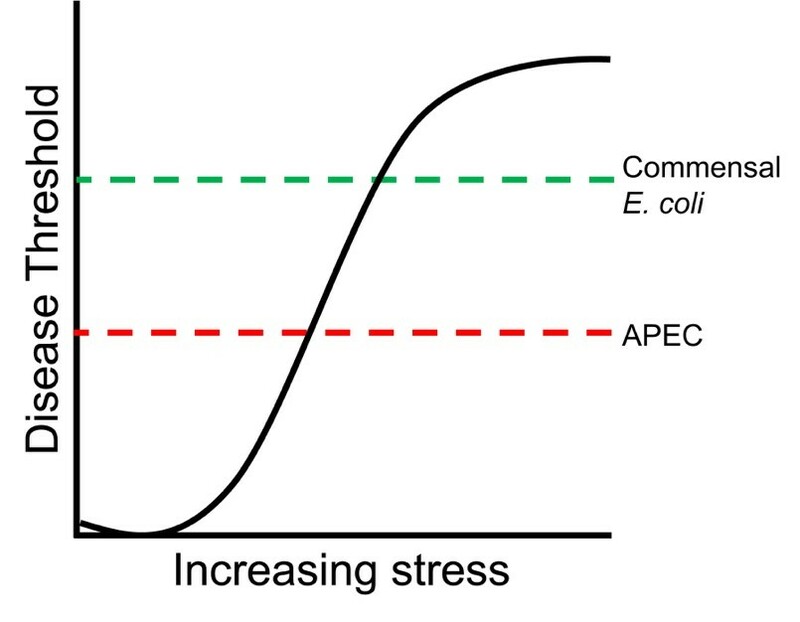 That is, signs of clinical disease will occur with fewer stressors when APEC are involved, as compared to when commensal E. coli are involved. 2. APEC are extremely diverse, making control difficult. Commercial vaccines against APEC typically target a small number of serotypes. Yet, APEC from turkeys belong to many different serotypes. In the work below, several hundred APEC collected from diseased turkeys in the U.S. were genome-sequenced. 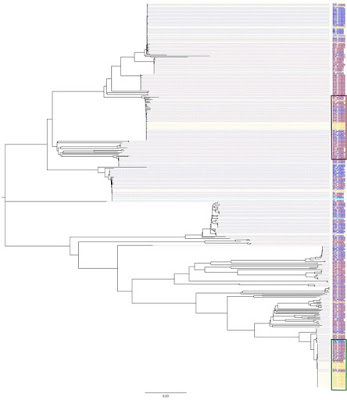 While some dominant serotypes were identified (red and green boxes), a vaccine designed against those groups likely would not protect against all APEC found in turkeys. Thus, control of APEC is very difficult with commercial vaccination. Autogenous vaccination using same-farm strains is more likely to be successful in this situation. 3. The absence of clinical disease does not mean APEC are under control. There is increasing evidence that APEC and other bacterial pathogens can impact performance, even in the absence of clinical disease. In particular, average daily gain strongly correlates with load of APEC carried by a healthy bird in its gut and respiratory tract. This suggests that the economic impact of APEC goes far beyond disease mortality and may impact the bottom line for producers irrespective of mortality rate. E. coli-associated disease has always been an issue for poultry producers, and certainly disease itself can be mitigated by controlling other pathogens and limiting bird stress. However, producers should remember that APEC are always there, they are diverse, and it is beneficial to target them for control even when increased mortality is not present.